So, Are you struggling to Build an Free email list? Don’t Worry It’s common problem with everyone. Today, I am here to help you in Building An free Email List Of 1 Million Subscribers In just 1 Week.. I know it’s sounds Fake…. But Trust me! after reading this full article, You will be able to build your own huge email mailing list without spending a single rupees. But before moving to my free email list building secret, Let me give you some necessary information about email marketing and How email Marketing can help your business to grow and earn more. Here is the Plain answer..
Basically, Email Marketing is the use of emails to develop the relationship with potential customers or clients. 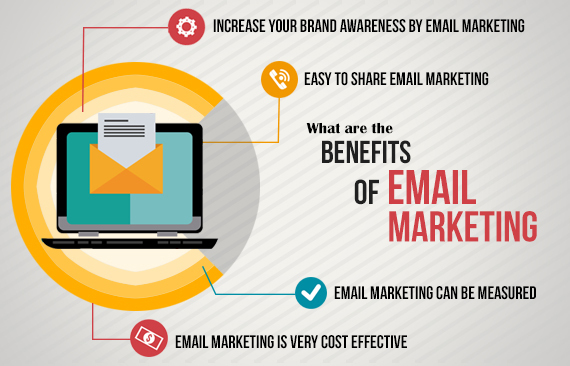 In an age of increasing usage of social media for advertising, Email marketing still ruling in the internet world. The number of email users worldwide is expected to rise to 2.9 billion by 2019. According To a survey conducted by Host Papa – 94% of Internet users use email, while only 61% are using social media. 70% adult online users says that email marketing is their preferred marketing method. According to a study of Campaign Monitor, For every $1 you spend on your email marketing campaign, you can expect an average return of $35 from them. 28% of customers like to receive a promotional message more than once a week. While 72% of consumers like to receive the promotional message once a week. Personalized email get transaction rate that is 7 times higher than other. Email Marketing allows targeting by age, income, etc. I think these facts are enough to Prove that email marketing still works. But Now let’s know how It can benefit your business or Blog? Build credibility: Peoples loves to do business with the person whom they know, like and trust. Email marketing gives you opportunities to build credibility with your audience by sharing informative content. The effects are easily measured: With some means of marketing, You can’t actually determine whether the money you have invested is paying off. But Through email marketing strategies you can easily determine how much effect has the campaign had. Cost-effectiveness: While there are many types of business promotion and marketing strategies are present, but Email marketing is by far the cheapest of them all. Strengthen relationships: If you want to build strong relationship or connection with your customers, then its important to have an effective tool to communicate with your customers. Email gives you ability to stay top-of-mind and keep people engaged with your business. Build your brand: You can strengthen your brand recognition with new potential customers, as well as it will extend your reach when your customers forward or share your message with a friend. Promote services: Services business faces the difficult challenge to keep their customer attracted toward their service especially when they aren’t looking for services at different times of the year. Email marketing gives you opportunities to get connected with your customers without overwhelming them with unwanted information. ﻿Increase website traffic: Building an email list is not only important for Business and organisation. If you are a webmaster then actually Your email list can increase your traffic upto 8x. According to me every marketer or Blogger should build an email subscriber list because Email list is completely yours. Your sites can be any time out rank by google or Social media algorithim can be any time get changed. But email list is your own asset and you can use them to grow your business. But Building an email list is not an easy work.. Most of the web masters fails to build build a targeted free email list. That’s why today i am here to help you in building a massive free email list in just 1 week. Don’t worry i will not ask you to purchase email list…..
Because buying an email list do not make any sense. Here i will show you How you can collect targeted email ID in your niche for free of cost.. So without further a do, Let’s jump right into the tutorial. Guys, Here i am sharing amazing tricks that you can leverage to get 1 million e-mail addresses. Just follow the step By step Process.. Step 1: First of all you have to set up your google chrome to create an email list. Firstly, Click On settings and go to search settings initially. Now here you will get an option called “Results per page” Normally you get 10 search results whenever you search a keyword on Google. So, Here you have to change it to 100 search results per page. This will massively help you in easily collecting email addresses. Don’t forget to click on save settings. Step 2: Now you have to go to a website called RecruitEm. This is the website whioch is going to help you in collecting e-mail addresses. Recruit’em is a tool that help you in finding right social profile for you. But here we are going to use it for building massive email list. Let’s see How? Here RecruitEm ask you to provide some basic information which will help you in getting targeted email Id. First of all you have to select “country” Now suppose you want to collect email addresses of people live in India. Then select it to India or you can even select it to US, Germany or any country. Next You have to Enter “Job Title” Basically Enter those Jobs which is related to your niche Of Business or Blog. Suppose I am running a blogging blog then i can enter “Blogging” as Job title. If you are running a Fashion Blog or business then enter “Fashion” “Fashion designer” Fashion Buyer” as Job title. Now you have to enter a Particular Location. Suppose you want to collect email addresses of peoples related to Blogging as well as those who specially lives in Delhi. Then you can Enter Delhi in Location Box. Similarly you can enter any part of India or Other Country. Otherwise leave it blank. You can also fill Education , employe positions details to get more targeted Result. Otherwise, Leave it as it is. Finally click on Find the right People on Linkedin. Now you will get a string Like this. Here you have to click on “Open in Google” button. 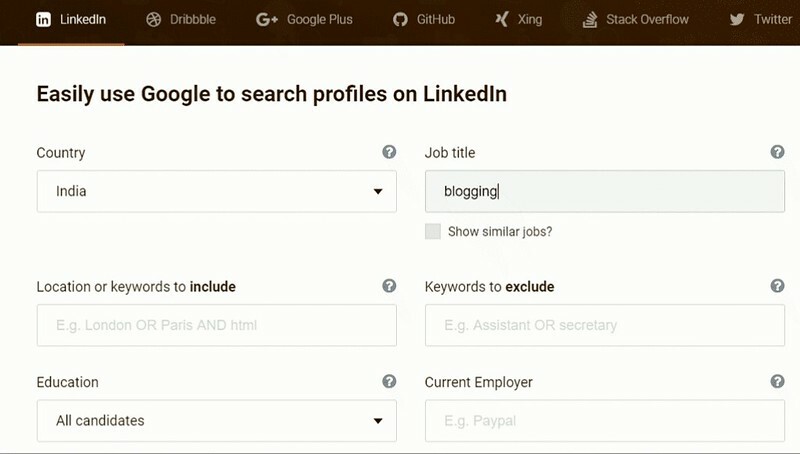 Step 3: Once you click on that button you will get lots of Linkedin Profile who are related to Blogging. Finally hit enter and search this string.. Here we have got all the search results with gmail Id. But , Now we have to extract all these mails from search result to build an email list.. Step 4: To extract all these mails from search results, you have to download an extension called “Data Scraper – Easy Web Scraping” Once extension is successfully downloaded, You have to sign-up with your Google account. Now click On Data Scraper Extension icon and then navigate to Public section, then navigate to “Generic Recipe – Get Emails Run” and then click on “Run“. Now this will extract all the email list from the Google result First Page, You can do the same for second, third and so on. Now from Data scrapper tool, you have to click on “Download” button and download all these emails as .CSV file. All the emails will be downloaded in an excel file. Step 5: Now we have to verify these emails to check that all these emails are valid or Not..
Don’t Worry It’s very simple to verify an email..
To verify all these emails you have to go to a website called leopathu. Next, you have to just copy all those emails and Paste it On leopathu website and finally click on Validate.. It will filter all the emails in just 4-5 seconds..
Boom… As you can see here, We have got 95 valid emails out of 100…You can simply download Valid emails in .csv file by clicking on Valid email. Finally, You can use all these emails in any email marketing software.. I personally prefer to use Get Response email marketing software. Guys, this is an amazing technique to grow your email list. Once you follow all these steps you can definitely build a massive free email list. The best part of this technique is you will get targeted email id. Suppose if you are in Tech niche, then you can collect email id of those people who are interested in Technology, If you are in Marketing niche, then you can collect email id of those people who are related to marketing.. Personally, I will not suggest you to use this technique every time to grow your email list. If you build your email list manually then you can build more strong connection with your readers because those readers are genuinely interested in your Blog and services. Moreover, I am also planning to write an guide on “How to grow your email list manually from Scratch” If you want me to write this guide sooner, Then just comment down below. Now i want to hear from you guys about what’s your thought on Building email list through this technique? Just comment down below.